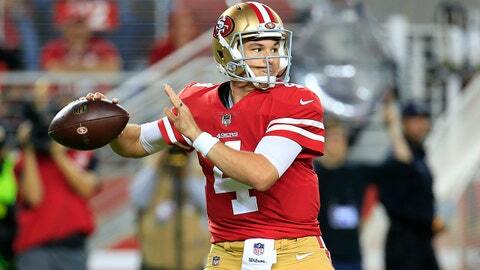 SANTA CLARA, Calif. (AP) — San Francisco coach Kyle Shanahan knew things wouldn’t always go quite as smoothly for Nick Mullens as they did in his first start. So when Mullens followed up his record-setting debut with a spottier performance that included two interceptions and a failed late drive, Shanahan wasn’t overly concerned and remains committed to Mullens as the starter when the team returns from the bye next week. Just about everything went right for Mullens in his debut against the Oakland Raiders on Nov. 1, when he joined Hall of Famers Jim Kelly and Fran Tarkenton as the only players with at least 250 yards passing, three touchdown passes and no interceptions in the first career game. He also had the most efficient debut since the merger for a player with at least 20 attempts, posting a 151.9 rating in the 34-3 win. It wasn’t quite like that in a 27-23 loss to the New York Giants on Monday night. Mullens went 27 for 39 for 250 yards with one touchdown and two interceptions. He helped San Francisco (2-8) build a 10-point lead in the second half before the team blew it. Mullens then drove the Niners to the 21 in the closing minute before his last-ditch pass sailed out of the back of the end zone to send San Francisco to another loss. Mullens’ best play came in the third quarter when he went through several reads before finding running back Matt Breida for an 11-yard touchdown pass that made it 20-10. But there were also some mistakes, like a slightly off-target pass to Marquise Goodwin that led to an interception in the second half and a late throw to Kendrick Bourne that led to an earlier pick in the first half that set up a New York touchdown. The 49ers should be healthy when they return from the bye with Shanahan predicting that everyone on the roster should be available to practice next week. That includes linebacker Reuben Foster, who missed the past two games with a hamstring injury, as well as receiver Pierre Garcon (knee) and safety Jaquiski Tartt (shoulder), who sat out Monday with injuries. Defensive backs K’Waun Williams (stinger) and receiver Goodwin were banged up in the game against the Giants but aren’t expected to miss any time.